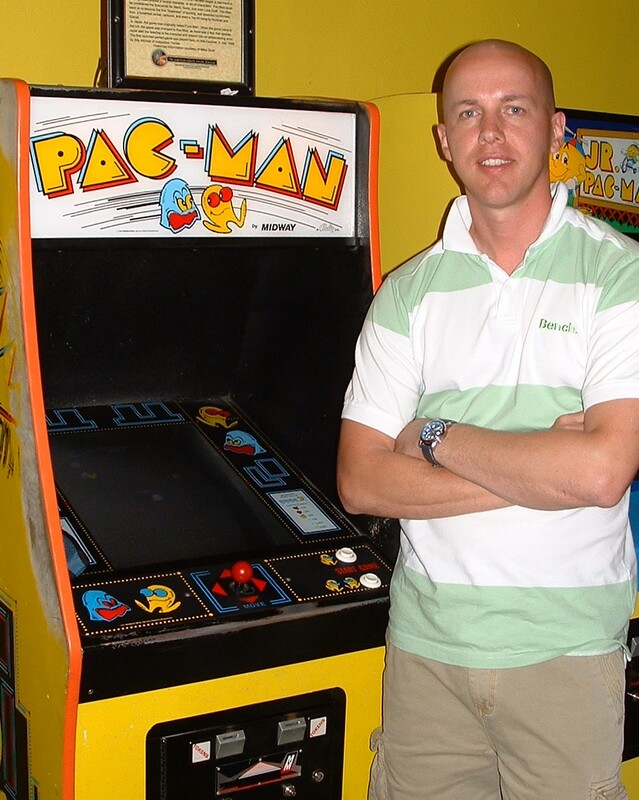 Having rediscovered his love for Pac-Man, Jon Stoodley decided in March 2009 that it was time to buy an original arcade cabinet so that he could enjoy the game in the comfort of his own home. Having picked up a dilapidated machine from Ebay for £150, little did he know that what lay ahead was almost as challenging as reaching the game’s legendary split-screen. Jon set his world record score of 3,221,000 on 19th June 1983 at Las Vegas Amusements in Liverpool. The score was the highest recorded in the ‘Golden Age’ of video arcades but was eventually beaten by Billy Mitchell, who went on to record the world’s first perfect Pac-Man score of 3,333,360 in 1999. During his visit to the legendary Funspot arcade in 2009, Jon set a new personal best score of 3,227,000, reaching the final split-screen in public for the first time in over 25 years. 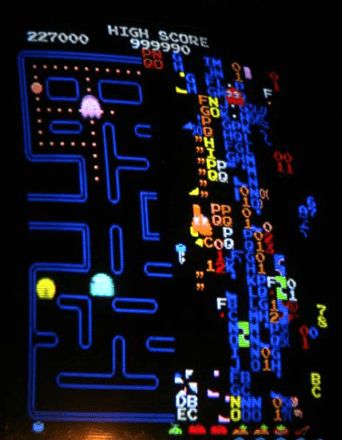 While many top Pac-Man players have studied the game’s inner workings using MAME save states, Jon was determined to achieve a perfect game the old-fashioned way, prefers to play ‘freehand’ rather than relying on following specific patterns. Jon realised his dream and scored the perfect game (using the machine he restored with his own hands) in front of a packed hall at the Play Margate video games event in Margate on 22nd August 2015. 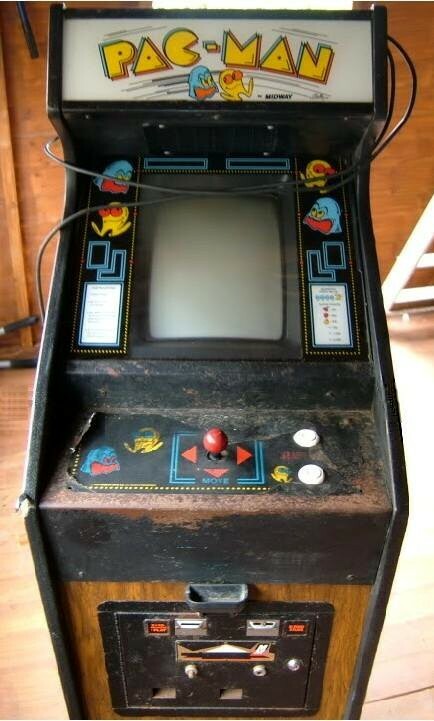 His skills don’t stop at Pac-Man however, as scores of 1,040,260 on Capcom’s 1942 and over 3 million on Konami’s Track & Field attest to. The machine was in a terrible state when it arrived. It had been sat in a pool of water in a storage unit for many years. My wife suggested that I should just burn it or get the Council to collect it. But I thought about the thousands of hours of fun that this cab had given to gamers, and the amount of smiles there had been beaming down at the screen. I promised that not only would it be played again, but would be as good as it was when it left the factory in 1980. The first job was to clean out and strip the cabinet down. My vacuum cleaner has a handy ‘reversal’ feature to blow air so I used this to clean out the insides after loosening the worst of the crud. Amazing what a brush, hoover and an hour of patience can do! The cabinet was then stripped down to a bare shell. The rotten wood in the base was removed and treated for wet rot, woodworm and damp. I actually created that hole by putting my hand through the rotten base when I picked the cab up! The rest of the cab was treated as well – every exposed screw hole and timber surface was done with a sponge and brush. The next step was the use of wood hardener on the rotten wood prior to the new base being fitted. The hardener is extremely irritant so it’s essential to wear a mask and eye protection. Once the wood was nice and hard the original base was levelled out and a new plywood base attached. I used a high grade ‘sandwich’ of two sheets to allow for both strength and the inclusion of either adjustable feet or castors. Once the base was sorted out I got to work on repainting the cabinet. After spending ages sanding them down I primed the ‘worked’ areas in grey, then painted them satin black. Even though some areas aren’t really visible, I wanted to make sure it was all done with as much attention as the rest of the cab received. I also sprayed the interior with black satin and it looked like new. The next task was one of the most laborious – replacing the woodgrain laminate sides of the cabinet. The best match I had for the original ‘Cherry Oak’ shade was obtained from Formica, costing £65 per sheet. The laminate was laid flat and the cab was then lowered on to it. I drew around the cab as a template with a pencil then used a Stanley knife to score along the lines. Extra care was taken on the curves as they had to be done freehand. The new sides were then carefully positioned and attached to the cab with contact adhesive. Once these surfaces come together there’s no way you’re going to reposition it, so this required a lot of patience! With the woodwork complete, the next job was the metalwork. The majority of it was sent away for blasting, treating and powder coating but the control panel was in an awful state. It probably would have been possible to get it re-manufactured, but I wanted to save every original piece that I could. The rust had eaten away some areas so badly that the only option was to use automotive body filler followed by the laborious task of using four grades of wet and dry to smooth everything out by hand. Following this I applied several coats of primer and matt black paint. The result was worth all the effort though. The replacement artwork was supplied by Monkey Online and his work is simply superb. To be quite honest though, if it weren’t for being a full restoration I would have ditched the front panel artwork as I have never liked it! As you’d expect, all the control panel components (visible or not) were thoroughly cleaned. New 1 and 2 player start buttons and a replacement joystick were provided courtesy of arcade expert Mark Alpiger. The remaining steelwork was finished by hand as well. The shot blast, treating and powder coat did the job but after the completion of the control panel the rest of the exterior steel didn’t meet this standard, so I decided to finish them in the exact same way as the panel. I may be able to reach the split-screen, but I’m a complete novice around electronics. Obviously the first job was to put everything back where it came from in the cabinet. All the wiring looms and connectors were cleaned thoroughly before doing this. I also did extensive work on the power board, rebuilding it on a new base and removing the surface rust from the transformers and connections with a trusty Dremel. The casings of the transformers were also given a coat of enamel spray. That was actually the easy part – the tough part was getting it all to work! When I first powered the cab up the monitor was completely dead. Replacing a couple of fuses fixed this, but things were far from perfect. The colours were all wrong, there was no blue and as a result, no maze. Every other aspect of the game played as it should, and the sound was perfect as well. It seemed like there was just the monitor to sort out in order to complete the project. It turned out there were several problems with the monitor. I worked out that the lack of blue was caused by incorrect wiring. The culprit was a small interface board that converted the video pinout from one monitor type to another. After days of messing around, I won’t say what I did to that little board! That wasn’t the end of things though, as when this was removed I had blue but no red – poor Blinky was almost invisible! With my trip to Funspot looming, I decided to send the monitor off to a specialist to be examined and repaired if necessary. After returning from Funspot I was even more determined to get the project finished. Feedback from the monitor repair people was not good – apparently one of the colour guns was on its last legs. I’d made contacts in America so asked them to try and locate a new 13” monitor for me, and within a few weeks a replacement screen was located, reconditioned and shipped. It looked like the end was in sight, but still more electrical problems remained. The new monitor was installed but now the screen was a garbled mess of graphics. I had the game PCB tested and it worked fine on other machines, so everything now pointed to an issue with power. Armed with a voltmeter, I decided to remove the power transformers from the base of the cab in order to test the voltage and fuses. All seemed correct and I was starting to despair, but I looked back at the screen and to my disbelief the game was working! In order to remove the power board from the base of the cab you have to disconnect the credit controller board. Usually this was re-connected when the cab was powered up, but when I removed the power board this time it was not connected. This board is not essential to the function of the machine so luckily I was able to bypass it. Still one unexpected problem remained – the red colour was still missing from the screen. 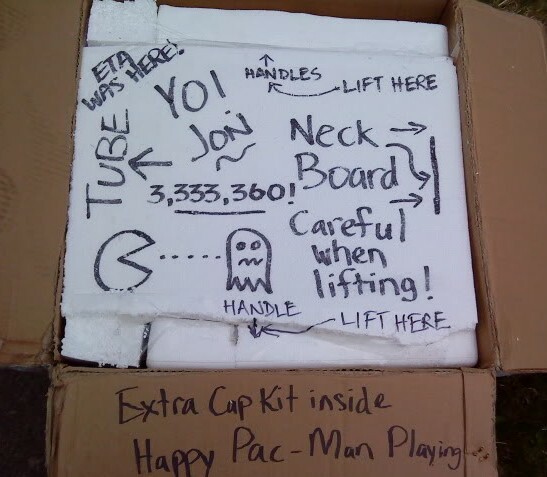 I started a game and it worked well, but the joystick wouldn’t move Pac-Man up. 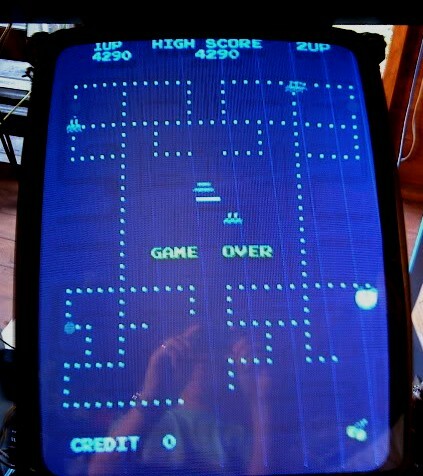 However whenever I pushed up on the joystick the red colour would return to the screen. I traced the wire from the joystick and found I had soldered it on to the red video connection by mistake. After re-soldering the two incorrectly-routed wires to the correct pins, the cab was finally working perfectly! After being nearly buried in March, less than five months later the machine was as good as new. Words can’t sum up how delighted I was – I spent a great deal of time, energy and no small amount of money on the project but it was all worthwhile. The amount of satisfaction I get when I see people playing the cab in public is priceless. Jon would like to give special thanks to the members of the JAMMA+ Forum (www.jammaplus.co.uk) for their invaluable help during this project. This article was first published in Replay Magazine 2011.